Nice find, stevenjay! The spot on Venus happens to be in the South polar region as well. They were both discovered on the 19th by astronomer observers of each planet. Also around that time, 10.7cm solar radio flux dipped to at, or near, a record low (since monitoring of that radio frequency began) following the most active sunspot so far in this cycle. Yeah, I wonder about that myself. Later this week, astronomers from Berkeley and around the world plan to conduct high-resolution visible and ultraviolet observations of the impact site using the Hubble Space Telescope's brand new Wide Field Camera 3. Ground-based facilities including the W. M. Keck telescope will also use adaptive optics to obtain much sharper infrared images of the impact's aftermath. Looking forward to seeing those images! Whatever it is, it's pretty kewl. Has any check on extra IR emission from our southern hemisphere been done? Land of OZ been too hot, lately? Does a 7.8 mag. earthquake in New Zealand count? "Strange things are afoot at the Circle K"
During the last two day the KECK and the IRTF on Mauna Kea, Hawaii, have been monitoring the Jupiter event. ...we should watch out further wheather we cant find any similar occurances, like that on the Venus, during the time of 16th till 20th July - that could point more towards an electrically induced event, influencing our whole solar system. New sunspot developing, but the magnetic polarity indicates a cycle 23 spot. Seems to be pretty far into cycle 24 for a previous cycle spot to be showing up. Don't know if it's relevant, but it might fall into the "strange things are afoot" category. It would be a huge shock to the solar physics world if this new spot is a member of the next cycle, 25. Probably not, but I'd love to see 'em squirm. 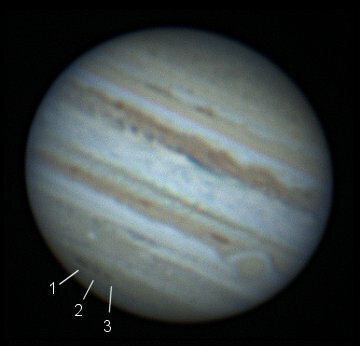 Hubble shots of the dark spot on Jupiter are in! Pretty cool that it's the first actual observational image after the recent upgrades, taking a break from the calibration routine. Compared to this series of images of one of the SL9 impact "plumes" spanning 5 weeks, after five days this recent one appears to be very well defined and organized by comparison. It could be an impact plume, not ruling that out at all, but it's kind of been morphing a bit like sunspots do, imho. I sure hope we get more shots of it at a later time to see if the spots are rotating around one another. As to the comments regarding this spot, the spot on Venus, and the weird weather on Earth with the advent of the new solar cycle- has anyone heard of anything weird on the Martian front? Also, the events on Venus and Jupiter are both southern hemisphere events- wasn't it the southern pole that David Talbott suspected was the location of the energetic events on Earth at the last cataclism? Would that mean the south poles of the planets receive more energy than the north usually? And if so- why might that be? From the strange things are afoot files. New developments with the Jupiter spot as reported on the SpaceWeather site. The same result has been obtained by astrophotographer Raffaello Lena of Rome, Italy. "On July 27th, the Jupiter impact site has evolved and now contained two condensed nucleii," he says. Those images can be found here. The Shoemaker-Levy 9 impacts didn't evolve like that. I was thinking I just had a wacky idea, now I'm not so sure it's all that wacky after all. LOL. As far as we know. OK. So now three distinct spots have developed after the original, single spot, morphed into two seperate lobes, which have recently morphed into three, or a "trifurcation". I know Jupiter's winds are strong, and both chaotic and organized, likely driven by electromagnetic forces, but this spot thing just seems to maintain a certain organization, and even growth, that doesn't appear to be driven by winds alone, if at all. I'll double check the dates, but I'm pretty sure that the appearance of this spot, as well as each time it has grown a new "lobe", coincides with a dip in 10.7cm solar radio flux. A few days after this alleged impact spot, apparently now known as Wesley's impact, it was announced that a veritable cornucopia of telescopes and instruments would be monitoring the event as it unfolds, but since then...narry a peep. Is the data that boring, or is it something that just doesn't compute? 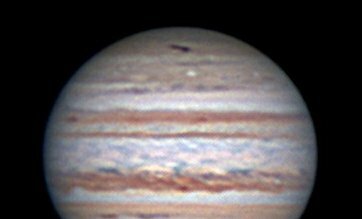 EVOLUTION OF AN IMPACT: Since July 19th, when Anthony Wesley of Australia discovered the scattered remains of a mystery impactor in the high clouds of Jupiter, amateur astronomers around the world have been photographing the planet every night. "German astronomer Hans Joerg Mettig has converted some of the best images into polar projections," says Theo Ramakers, "and I have stitched them together to make a movie." The 3-week animation, which begins with Wesley's discovery image and ends yesterday, shows the cindery cloud expanding, swirling, and ultimately being torn into three pieces by turbulent south polar winds. "The spot has really progressed dramatically," says Ramakers. No one knows how the movie will end. Planetary scientists say the debris could evolve in interesting and unexpected ways before it finally disperses some weeks from now. Astronomers who wish to contribute scenes can monitor the cloud near Jupiter's System II longitude 210°. For predicted times when it will cross the planet's central meridian, add 2 hours to Sky and Telescope's predicted transit times for Jupiter's Great Red Spot.